Trinidad and Tobago are yet another small part of paradise. Located in the Caribbean, just north-east from Venezuela, the islands provides a perfect spot for relaxation and dream vacation destinations. However, Trinidad and Tobago do not rely on tourism as much as you would think, which is why the location is prosperous even without tourists. As a result, Trinidad and Tobago are one of the most prosperous islands in the Caribbean. Before you go there and enjoy a perfect tan on the white sandy beaches, there are a few things you should know. When you plan your vacation to Trinidad and Tobago, the first thing you need to check is whether or not you need a visa to gain entry. The visa policy of Trinidad and Tobago is lenient, fortunately, and you may not need one. The citizens of 101 countries and jurisdictions are exempt from getting a visa, and they are allowed to stay within the islands for up to 90 days in a 180-day period. While Australia, New Zealand, and the Philippines are not on that list, their citizens can obtain a ‘Waiver of the Visa’ on arrival. 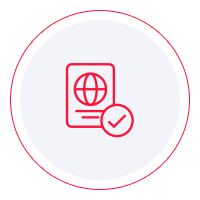 If you are looking for your country of origin on the list of visa-exempt countries and you cannot find it, it means that your only option is to apply for a visa for Trinidad and Tobago. You can visit the nearest diplomatic mission and submit your application there. The process is reasonably cheap, and it does not take long. Getting to Trinidad and Tobago is pretty simple. One option would be to take a flight, but the location is very popular among yacht owners. Maybe you can tag along with one of them. Plus, many cruise ships make a stop in Trinidad and Tobago, so getting there is not an issue. Getting around is just as easy. You have multiple options at hand. One would be to take a taxi since they are widely spread. Car rentals are also available, and traveling between islands is possible by boat and by ferry. Neither of them is costly, so exploring both islands should be plain sailing. Communication in Trinidad and Tobago should not impose a problem. The official language is English. The only particularity, in this case, is that you will hear it in both American and British English, but other than that, you should be able to communicate with everyone on the islands. As for what you can do in Trinidad and Tobago, the possibilities are endless. The most popular attraction on the islands is, of course, the beaches. The luxury resorts, as well as the hotels, provide perfect beaches with white sand and the perfect blue of the Ocean. You can lay o one of the countless beaches all day long and enjoy colorful and tasty cocktails. We recommend that you explore other attractions as well. For one thing, the coral reef is stunning, and some services provide Glass Boat rides. The boat is not made entirely of glass. Only the bottom is, and that allows you to admire everything underneath. It is a beautiful experience, and you should not miss it. If you are a bird enthusiast, the Caroni Bird Sanctuary is everything you need. It is located in the Caroni Swamp, and it is heaven for bird watchers. Several indigenous birds call the swamp their home, and among them is the Scarlet Ibis. However, you should wear very thick clothing, as the guide tours suggest. There are a lot of mosquitos in the swamp, and they can bite through almost everything. Jeans would be the best choice and long-sleeved shirts. If you happen to arrive in Trinidad and Tobago at the end of July, you should check out the Tobago heritage festival. It lasts two weeks, until the beginning of August. It is a marvelous event with Tobagonian dances, music, culture, and let’s not forget about the food. You can experience the island’s heritage first hand, and you will love it. The bottom line is that Trinidad and Tobago has a lot to offer. Even if you have been in many places around the world, this small Caribbean piece of tropical paradise will enchant you. The people are great, the food is delicious, and you can have a lot of fun. There is no dull moment in your stay there.